IPEM is engaged in design, manufacturing and suppling of high quality process reactors.Reactors, unlike mixing vessels are totally sealed & designed to disperse two or more processed materialstogether. Reactors on other hand, allows the processed materials inside to go through a reacon phase whichulmately produces new and different product properes. Design of a process reactor deals with mulple aspects of process engineering. Process engineer designs thereactors to maximize net present value for the given reacon. Designer ensures that the reacon proceeds withthe highest efficiency towards the desired output products, producing the highest yield of product whilerequiring the least amount energy to operate. The batch reactor is the generic term for a type of vessel widely used in the process industries. 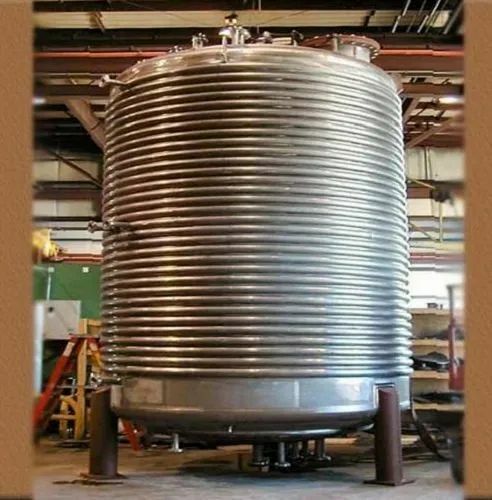 Its name is something of a misnomer since vessels of this type are used for a variety of process operations such as solids dissolution, product mixing, chemical reactions, batch distillation, crystallization, liquid/liquid extraction and polymerization.We have many kinds of types and dimensions of overall dimension, inlet size, water inlet and outlet size, cooling water flow and net weight. We have emerged as the foremost manufacturer and supplier of Reaction Vessel that are used for storing various types of industrial liquids and gases. Our experienced professionals manufacture these vessels using the best quality raw material and sophisticated technology following the predefined quality standards. As well, customers can avail these products from us in various specifications at market leading price. We have emerged as the foremost manufacturer and supplier of Stainless Steel Reactors that are used for storing various types of industrial liquids and gases. Our experienced professionals manufacture these process vessels using the best quality raw material and sophisticated technology following the predefined quality standards. As well, customers can avail these products from us in various specifications at market leading price. We have emerged as the foremost manufacturer and supplier of wide range of Reactors that are used for storing various types of industrial liquids and gases. Our experienced professionals manufacture these vessels using the best quality raw material and sophisticated technology following the predefined quality standards. As well, customers can avail these products from us in various specifications at market leading price. We have emerged as the foremost manufacturer and supplier of Stainless Steel Reactors that are used for storing various types of industrial liquids and gases. Our experienced professionals manufacture these vessels using the best quality raw material and sophisticated technology following the predefined quality standards. As well, customers can avail these products from us in various specifications at market leading price.